My 1-2-3 Cents : Boo: Happy Birthday Kane! I've blogged about Kane before, but I can't let the 15th anniversary of his character introduction pass without acknowledging it and updating my thoughts on the Big Red Monster. I was in the Savvis Center (now Scott Trade Center) in St. Louis the night Kane debuted at Badd Blood. We all know the story by know, Kane was the younger brother of the Undertaker who had been burned and lived a miserable life. He was brought to the WWF by Taker's former manager (and later revealed Kane's father) to destroy the dead man. That night he did just that as he ripped the doors off the Hell in a Cell cage, entered the ring and tombstoned a shocked Undertaker. This enabled Shawn Michaels to win the first ever HIAC (which still holds up as one of the best of all time). 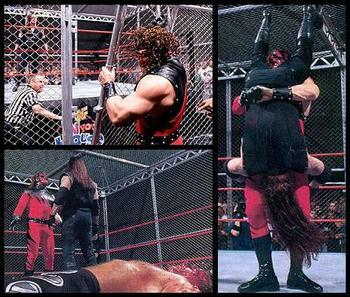 Kane went on to feud with the Undertaker off and on his entire career in the WWE. They teamed up as the Brothers of Destruction and won tag team gold on more than one occasion. They're most recent feud in 2010 was during Kane's World championship reign in which the Monster got the upper hand on his brother. But at Raw 1,000 the brothers once again reunited. It's been the last sighting of the Undertaker so far this year, and ironically again it was in St. Louis. I think the Kane character has lasted so long because the WWE got behind him and Glenn Jacobs (the man behind the mask) has really embraced it. The monstrous, evil Kane hit the scene at the right time. The WWF was struggling in the ratings war with WCW. I've always enjoyed the monster heel version of Kane, but really as he's evolved through the years I can't say there hasn't been a phase that I haven't liked. We've seen Kane fall in love and even get married (to Lita) and then divorced. He's set legendary announcers (JR) on fire. Kane even, for reasons no one is quite sure of, has destroyed baseball legend Pete Rose on more than one occasion. For years, Kane went without the mask, but earlier this year (or maybe late last year) returned with a new look. He initially came back as evil Kane feuding with John Cena trying to get him to embrace the hate, which never really worked. He picked up in my view an upset win over Randy Orton at Wrestlemania 28. More recently, he got embroiled in the love square with AJ, Daniel Bryan, and CM Punk. I'll admit at first, I wasn't sure why he was participating in this angle, but I've gotta tell you I love where it's gone so far. The Anger Management vignettes in the beginning of this angle were high quality entertainment. Kane and Bryan are the unlikely tag team champions, and as Team Hell No are destroying the competition. My only worry for the duo is over saturation, which is a legit concern in this day and age of wrestling. Glenn's early days as demonic dentist Isaac Yankem to the fake Diesel (and even the Christmas Creature) put him on the path to Kane. It's a role he has done well with. Congratulations and enjoy continued success.